How to paint with single pixel? GIMP Forums / GIMP / Beginners / How to paint with single pixel? I'm really frustrated now because this never used to be a problem, but I know that everyone works really hard for free to make GIMP a reality so I hope my frustration doesn't come off as lack of respect or ungratefulness toward the many fine people who work on GIMP. So before I start my somewhat frustrated rant, I want to thank you all. Also, I'm running Linux Mint, in case that matters. I need to draw with a pixel. Really seems simple enough. However, the brushes section has turned into some sort of modernesque panel for doing everything except the simple stuff. I've tried finding something about this online but every time I only run into entire tutorials on how to do something really fancy or advanced, when all I want is a 1x1 pixel with which I can draw colors. No transparency, no features, just a 1x1 pixel with a single color, without effects or filters of any kind. I need this to fix miniscule details in an image, pixel-by-pixel with the Pencil tool. As you can see in the accompanying screenshot, Brushes-1.png, I can select something that *claims* to draw 3x3 but actually, it draws something closer to 12x12 or so and as usual I have no idea why. In Brushes-2.png you can see the editing box for this brush. I've fiddled around with a whole bunch of settings but none of them seem to allow for this simple task. My searches online for a solution to this ridiculous problem have so far proven fruitless. Finally I would like to re-iterate my thanks to the community for the selfless effort put into GIMP and this forum. Please forgive my frustration. Thanks in advance for any help with this issue. RE: How to paint with single pixel? Choose the brush called '1. Pixel'. Reset the Brush Size to 1. Thanks a lot for the response! Appreciated! I still find it very strange that this option has a default value of 20 pixels and that the size isn't configurable on the palette where you select the brush. It seems like the kind of option that people are the most likely to want to at least see, especially when the default value is 20. (Sep 27, 2014 22:57)fluffybunny2 Wrote: Hi and welcome. @Teekin If you ever come back. You missed the point of FB2's post that you need to use the pencil tool rather than the paintbrush. 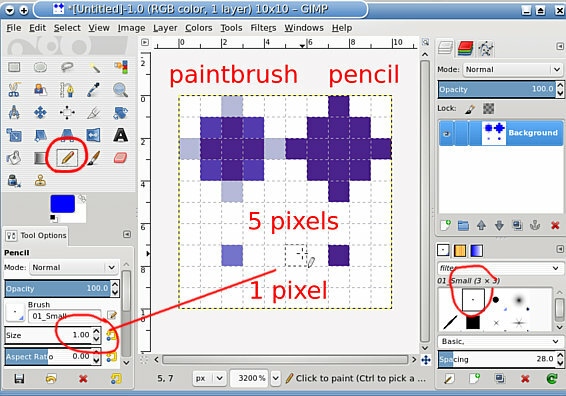 The paintbrush applies anti-aliasing which introduces semi-transparent pixels to give some smoothing. This very small image 10x10 pix shows the difference.